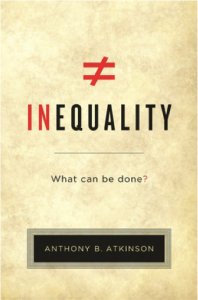 In his latest book, simply titled “Inequality – what can be done?”, Tony Atkinson not only provides a thorough analysis of economic inequality in the UK and other Western countries. He also puts forward some bold proposals to reduce inequality. And, a few of these have clear feminist character. His book, dedicated to “the wonderful people who work in the National Health Service” belongs to a recent flow of books and reports on the negative effects of inequality for people, societies and economies. From Piketty’s Capital in the 21st Century to The Spirit Level by Wilkinson and Pickett as well as the OECD and IMF. So, what are his feminist proposals? Minimum wage set at a living wage for everyone and a code of practice to pay above the minimum. 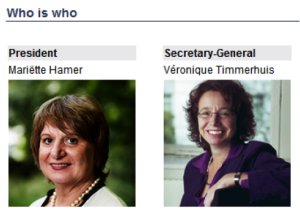 For this proposal, he points at the Dutch poldermodel of the SER, the Social and Economic Council, consisting of employers and labour unions, advising the government on social economic matters. The SER, by the way, is headed by a female president (Mariëtte Hamer) and a female director (Véronique Timmerhuis). Capital endowment (minimum inheritance) paid to all at adulthood. This is, of course, a radical change of current inheritance practices that reinforce exiting wealth inequalities in societies. On inheritance, he also suggests that the tax should be changed to a lifetime capital receipts tax. The more wealth transferred to people who already have a lot of wealth, the higher the tax rate. Such a wealth tax reform would give an incentive to redistribute one’s wealth to relatively poor households rather than those already wealthy – rest in peace. Child benefit should be paid for all children at a substantial rate and should be taxed as income. This is a key policy tool against child poverty and inequality in living standards among children (with a progressive income tax rate, of course, for which Atkinson advises top rate of 65 percent). Participation income, for any work including voluntary work, should be introduced at national level, complementing existing social protection, with the prospect of an EU-wide child basic income. This alone would be a strong argument against Brexit, I would think. Unfortunately, social policies do not make part of much of the Brexit debate. Finally, is this all trifle-in-the-sky? No, Atkinson has done his calculations. If all his proposals, including those mentioned above, would be implemented, UK’s Gini-coefficient would go down from 32 to 28, and in a revenue-neutral way. In other words, no increase in government spending needed. No increase in public debt. Even no farfetched budget shifts away from, for example, military expenditures or roads building. Simply more equity in the primary income distribution (reducing bonuses and extravagant incomes), more equity in the secondary income distribution (through taxation, subsidies and social protection) and more equity in the tertiary income distribution (ensuring that most of the benefits of public spending benefit the least well-off rather than tax-breaks for multinationals, for example, a fiscal practice that is embarrassingly widespread in The Netherlands). 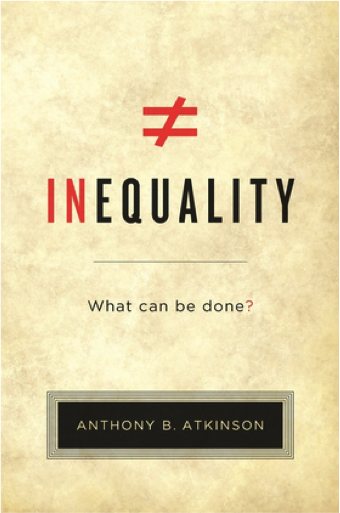 Moreover, Atkinson emphasizes that such income equality policies should take intra-household distribution into account. Now, Sir Tony Atkinson may not be labeled as a feminist economist but his proposals are clearly concerned with the wellbeing of men, women and children, as the objective of feminist economics, after all, is.